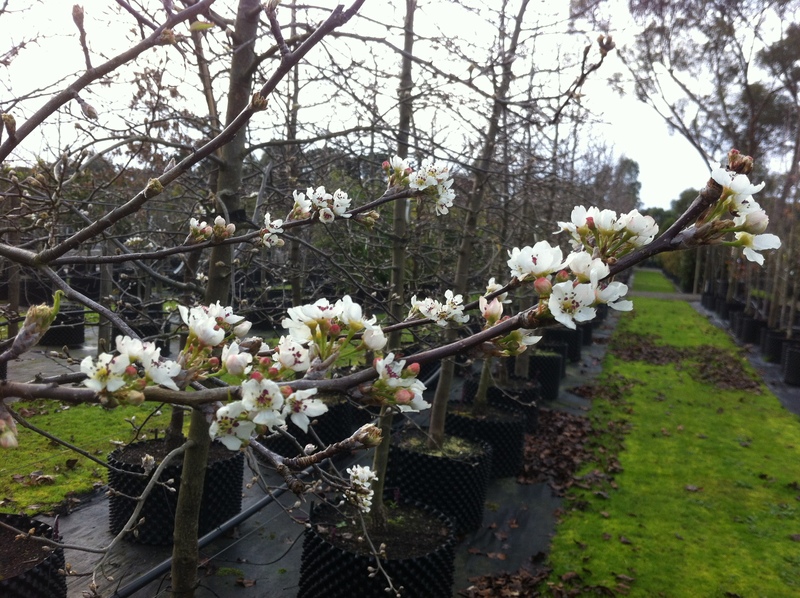 I thought about this when I noticed that a couple of Manchurian Pears (Pyrus ussuriensis) had started to flower. We take it for granted, but the ability of plants to flower at the right time is fundamental to human well-being. Not only directly with the production of fruit and vegetables, but the wider health of the planet’s biosphere is dependent of the success of flowering plants. Evolutionary pressure means that most plants invest the maximum possible energy into flowering, so it has to be worthwhile in terms of getting the highest fertilization rate. Flowering is often intimately connected with the life-cycle of pollinating insects, and a mis-alignment of either can spell disaster for both. Plants also have to flower when others of the same species flower. The very act of flowering is to provide a way of cross-pollinating with plants of the same species, allowing the chance of random genetic variations that will endow their progeny to be better adapted to the environment. Most flowering plants flower on a seasonal basis, whether it is in the temperate regions to coincide with the seasons, or in tropical regions where rain maybe available only during some months of the year. Most plants use a combination of two different methods to work out when to flower – night-length (called photoperiodicity) and temperature. A master control gene called Apetala1 triggers a cascade of more than a thousand other genes that initiate flowering. This combination allows the plant to best interpret both the time of the year and the prevailing weather patterns, reducing the risk of flowering at a time that doesn’t synchronise with others of the same species or pollinating insects. Where seasonal variations in temperatures are more pronounced, there can often be spectacular flowering events. In some cases flowering is ‘pre-programmed’ for a certain time after seed germination. Plants growing in deserts, where infrequent rains trigger mass blooming, often use this method, leading to the short but spectacular displays. So why then would a few pears be flowering now? The short answer is that it is a sort of species insurance. Whilst, in general, it is better for plants of the same species to all flower at the same time, it also means that the entire population is vunerable to catastrophic weather events. A single storm during flowering could destroy a large number of flowers. By having a few plants in a species blooming out of sequence, it means that those plants may have flowered and set seed before a storm could destroy the main flowering event. Interestingly, it is very rare that individual plants will flower later than the majority of the species. Understanding the genetic mechanism that triggers flowering is becoming increasingly important. Crops grown in cooler areas could be manipulated into flowering early, giving time for the fruit to develop and allowing production in areas that aren’t presently used. It can also be used to manage pollinating resources. Large numbers of bees are hired each year by farmers to pollinate crops. By altering the flowering times of plants, bees resources could be utilized over a longer period, reducing the bottleneck of demand by growers.